Place potato slices in a medium-size deep skillet and season with salt and pepper to taste. Pour the chicken broth or stock over the potatoes, add the butter, bring to a boil and reduce the heat to medium. 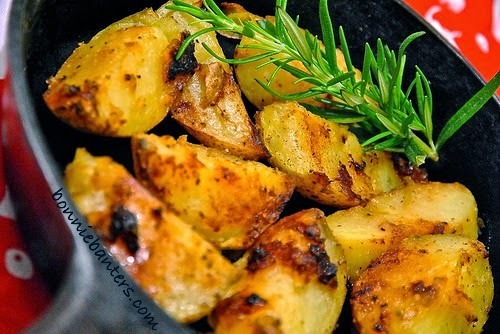 Cover the skillet with a lid and cook the potatoes until almost tender, about 5-8 minutes. Remove the lid and allow the broth or stock to evaporate, approximately 10-12 minutes more. Brown the potato quarters on all sides, about 5 additional minutes. If needed, add more salt and pepper to taste. Serve on a platter or in a bowl and garnish with a parsley or rosemary stem. Leftovers may be reheated in a 400º oven in a shallow pan (lined with foil and sprayed with a non-stick cooking spray) for about 10 minutes, or until hot. You'll truly enjoy these gratifying pan-steamed potatoes as a delectable and easy side to your meat and poultry dishes! They're versatile for sure! They'd be great as a hearty breakfast side...bring on the eggs (and turkey bacon)! Thanks and enjoy Regina! Love the ease of prepstation with sacraficing the visual simplicit of the end product. Homestyle enough to accompany a burger, sliced cold & added to salads; Yet, with its understated elegance, it would be a welcomed and appropriate side to even a more formal holiday meal or an intimate dinner. I can't wait for my flight to land tomorrow as I've already planned an entire around these potatoes. One question: must it be Yukons? I have an affinity to fingerlings. Though I've not tried this recipe with fingerlings, I'd say give it a whirl...bet they'd be good! Let me know how they work and thanks for your wonderful comment! Enjoy!